Opera offers a clean, modern web browser that is an alternative to the other major providers. If you are unhappy with your current browser, consider Opera as a viable option. Opera provides their browsing software free of charge and is available on just about any device. Download the Opera browser for free for an alternative internet experience. Opera has a solid background in providing internet browsers. The first version was released in 1995. On April 12, 2016, the company unveiled the latest version of the Opera browser. Opera Mini: This browser is primarily available for mobile devices. Accessing the internet with Opera on iOS, Android, Windows Phone, tablets, and PDA’s is simple with Opera Mini. Mini is intended to be faster and offer more functionality for mobile devices. Opera web browser: Available on Android, PC, Mac, and Linux, this browser has a sleek modern interface and boasts a fast connection. Opera Coast: Coast is primarily available for the iPhone. This browser offers a smooth internet experience for iPhone users looking to ditch Safari. Opera Max: This Opera browser is available for Android devices and is intended to reduce your data usage. Complete with data usage apps, this browser shrinks your streaming to extend the life of your data plan up to 50 percent. Check Opera’s website for more information on the different web browsers. 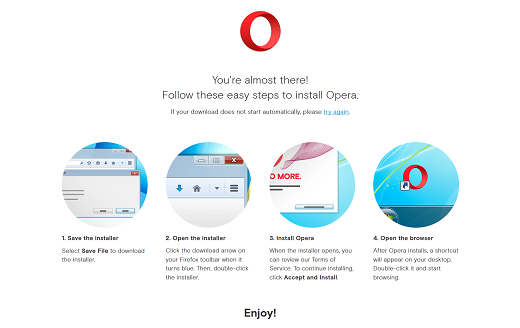 Opera’s browser provides simple steps to make the download process easy. Time for some web surfing! Speed Dial: This is Opera’s way of putting your favorites on standby. Your most-used sites can live here for quick access. You will see a display of these sites when you open Opera’s browser. Bookmarks: Adding bookmarks for the sites you visit frequently is easy. Opera also provides you with tools to manage your bookmarks. Tabs: This feature shows you all of the websites you have opened in tabbed browsing. History: This option shows you a chronological list of the websites you have visited, organized by day and time. 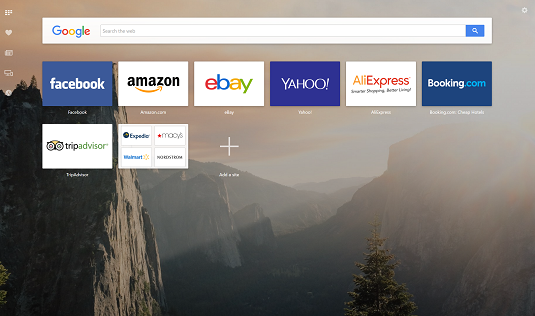 Opera’s main toolbar provides you with more options for customizing your internet experience. As with other browsers, you can surf in private mode, zoom in and out on content, print, view your downloads, customize your home page, modify themes, add extensions, and so much more. Under the main menu, you can also choose Opera Turbo. This is a free service provided by Opera that speeds up slow connections. This browser has it all!